An octet for eight cellists – what a sound! And what a great piece to play when eight cellists are in one place – perhaps in the break of an orchestra rehearsal, or on a music course, or even in a sectional rehearsal when the work to be rehearsed has been perfected? This fun piece has good parts for all eight players, and is not very hard, although the 1st cello part goes pretty high sometimes. The history of this piece is that Jacob's Suite for Violas, dedicated to the memory of Lionel Tertis, inspired the noted English cellist and teacher Florence Hooton (1912-1988) to commission, in 1981, this Cello Octet for her students. Later, to honour the seventieth birthday of her husband, the violinist David Martin (1911-1982), she also commissioned a Suite for Eight Violins, (published by SJ Music: E2009-2) so that violists, cellists and violinists would all have their own ensemble work. 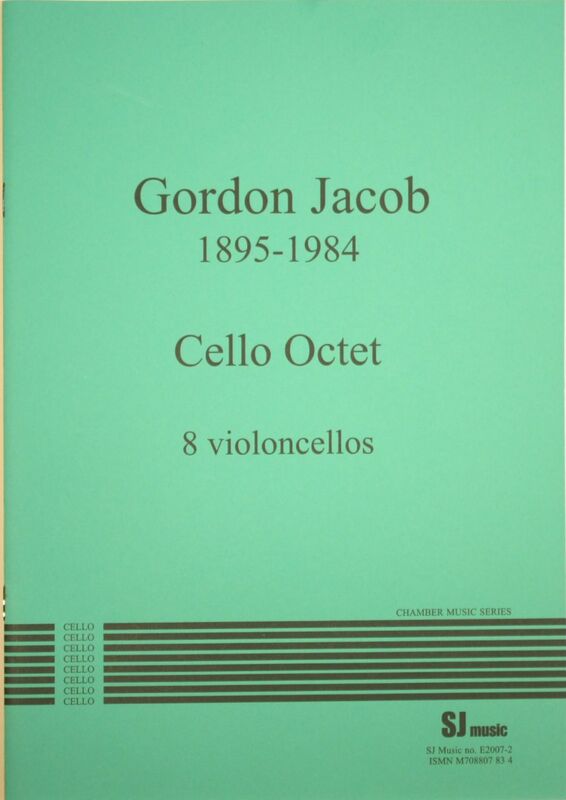 Gordon Jacob was born in London in 1895 and died in 1984. After serving in World War I he studied composition, theory and conducting under Stanford and Howells at the Royal College of Music. (Stanford’s fifth quartet is published by SJ Music: Q1998-1; and two Fantasies for clarinet and piano: Q1996-5 and Q1996-7). From 1926 Jacob taught at the RCM and stayed there until his retirement in 1966. Jacob was a prolific composer and published over 700 pieces of music in addition to four books and numerous essays on music.